All of our puppies are non-shedding with the exception of the Samoyed and Shih-tzu. 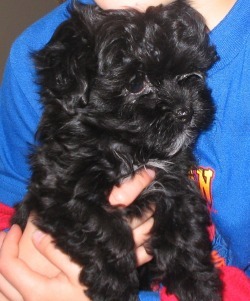 Toy Poodle - they come in various colors, we have black, white, red, apricot, and silver. A small dog with lots of smarts. Non-shedding. Bichons are always white in color. They are one of the most hypoallergenic dogs around - no dander. Very playful, great with kids, an all around good companion. Non-shedding. Maltese are always white in color. They have an adorable baby-doll face. Weighs between 4-8 pounds, a great little lap dog. Non-shedding. Yorkies have shades of black, gold, and or silver hair. A smaller dog weighs around 4-8 pounds. Non-shedding. Sammies are always white in color. A larger, husky-like dog. Loves the outdoors and winter time too. A Teddy Bear is a cross-bred puppy that has 3 or more breeds in it's background. Our Teddy's are 1/2 Bichon, 1/4 Shih-Tzu, and 1/4 Maltese. Some Teddy's are all white, while others can be black and white, or other color combos of cream, chocolate, and browns. Non-shedding. 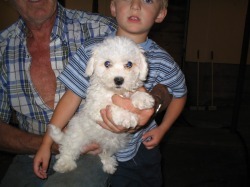 A cross between a Bichon (always white) and a Toy Poodle. 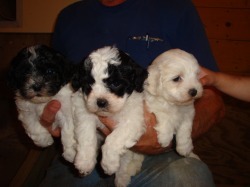 The color of the puppy will vary depending on the color of the Toy Poodle. Non-shedding. A cross between a Yorkie and a Toy Poodle. These puppies tend to have coloring similar to Yorkies but, that can vary. The hair may be softer and fluffier than a regular Yorkie. 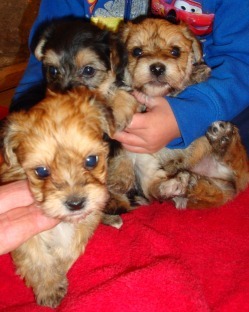 (This pic from theyorkiepoo.com). A cross between a Maltese (always white) and a Yorkie. Tend to have Yorkie markings and color but a little lighter. They seem to have the Maltese baby-doll face. Non-shedding. 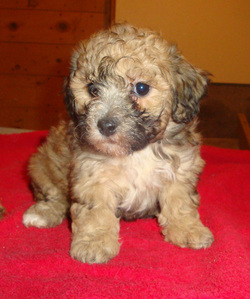 Shih-tzu poodle mix. Blunt nose more like Shih-tzu and various colored markings. Smarts of a poodle and non-shedding. A cross between a Yorkie and a Bichon (always white). Puppies look a breed of their own, colors can range from black, sable or light brown. Non-shedding. Pekingese and Poodle cross. The female Pekingese is fawn color and usually mated with a red poodle male. The puppies turn out shades of red and are non-shedding.